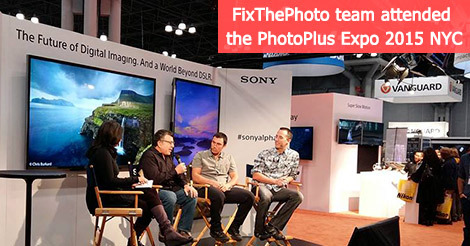 On the 21st - 24th October 2015 in NYC FixThePhoto team visited one of the greatest photo trade conference ─ PhotoPlus Expo 2015 that ran at the Javits Center. This was a wonderful chance for us to get a valuable and potentially career-changing advice from industry insiders and make it real in our work. On the 21st - 24th October 2015 in NYC FixThePhoto team visited one of the greatest photo trade conference ─ PhotoPlus Expo 2015 that ran at the Javits Center. The hall was full of diverse audience starting from the world-known photographers and ending with students and educators from each corner of the world. The PPE introduced over 100 educational seminars, film-making cources, Photo Walks and Master Classes, over 200 exhibitions showing the latest products and services of photo industry. PDN PhotoPlus International Conference + Expo is the biggest imaging conference in North America. The best for us was to be the part of the big community, it was combination of everything. 2015 conference seminars suggest a wide range of subjects in eight educational tracks including Lighting, Portraiture, Wedding & Events, Commercial, Editorial & Photojournalism, Filmmaking, Business & Marketing and post production photography. At the Photo Walks we tried new techniques, learned about design and composition walking on the New York City streets led by the popular photographers. 21,000 attendees have several conference pass options including a Full Conference Pass with access to all conference seminars during 4 days. The Master Classes provided a hands-on session continuing for 2 hours where only 50 listeners could receive a great experience and knowledge. Seminars were led by famous photographers and educators like Sue Bryce, Lara Jade, Jay Maisel, and Art Streiber. Lauren Greenfield opened her `Fast Forward to The American Dream` keynote, Dennis Keeley spoke about street photography, and Jimmy Chin discussed his award-winning documentary, MERU at the 2015 PhotoPlus Conference + Expo. All presentations were listened to by us very attentively and had us use their techniques at our work. The trainers shared some of their tricks in working quickly in the studio and talked about how to deal with clients in hard situations while still getting what you need. The official Portfolio Review program is the largest national portfolio review event in the north US from both commercial and fine photographers. This can be named a `speed-dating`. It was a great opportunity to meet more professionals, extraordinary photographers and editors there. In our digital world, face-to-face meetings are wonderful and necessary to maintain our awareness in image industry. The pictures were presented in different subjects: Family, Travelling, Animals, Holidays and etc. Besides, if you want to know how to edit you holiday photo in the best way follow 5 Tips to Shoot Great Family Photos we wrote about earlier. PhotoPlus Expo 2015 was a great place to speak to friends and colleagues you may only know `virtually`. The PPE showcases not only digital film-making and imaging, but also it inspired not to miss an opportunity to explore an inspiring array of photography products and services — all from the industry`s leading organizations. If you wish to be taught by the world-renowned experts and to know each modern cutting-age innovation in photo industry, visit this conference next year. This was a wonderful chance for FixThePhoto team to get a valuable and potentially career-changing advice from industry insiders and make it real with our professional retouching services.